"The Symphony on a Pavan reveals a composer at the height of his powers, revelling in the complete command of his metier. Hardly surprising, then, that it is a predominantly happy piece - and one which should cartwheel round the world: it could well become an orchestral favourite." "Its opening movement had a surging, off-kilter energy, marred only by a tendency to say everything at least three times. Strings and trumpets exchanged dance-like refrains over the patter of rototoms. That, and an atmospheric slow movement in which sinuous melodies twisted against a smeary skyscape of high violin glissandos, were the symphony's most memorable parts. "But the work's thematic material (partly derived from a Pavan and Galliard by William Byrd) was highly accessible and the orchestration intriguing ... this was a persuasive first performance." "Pianist-composer John McCabe's new horn concerto - written in memory of Ifor James and premiered in this concert by David Pyatt and the BBC National Orchestra of Wales - was an affectionate portrait of both a friend and the instrument itself. Nevertheless, the deeper, more searching elements of the writing ensured McCabe's characteristic balance, where instinctively felt ideas are worked through with precision. "Over the span of a single multi-sectioned movement, the romantic, heroic facet contrasted strongly with the other influence in this concerto, the horn sound of 1950s and 60s west coast jazz, but it was the clarity of Pyatt's engagement with different instruments in the orchestra, notably marimba and woodwinds, that was most persuasive." "Beautifully written and occasionally reminiscent of Sibelius, it generates considerable tension through the juxtaposition and development of soaring woodwind with phrases that rise, with mounting insistence, from the depths of the strings." "... inspired by the man-made caves outside Liverpool, and also (the composer suggests) a metaphor for the city's historical struggle from darkness to light. Beginning with Pastoral birdsong, then passing through bitonal turbulence, it gradually gathered its energies into a sonorous dancing finale. A well-made symphony that deserves to be heard outside the city that nurtured it." "... from a contemplative start, this complex piece also tested the RLPO and yet we heard them at their best. 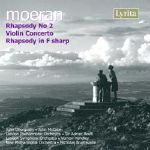 The numerous solos which the composer demanded were handled excellently and this, McCabe's Seventh Symphony, is certainly worth a second hearing." This CD was awarded Best New Piano Music Recording of 2007 by International Piano magazine, November/December 2007. The citation reads: "A brilliant performance by McCabe of his 'Southport' Concerto, the first of his four concertos for the instrument to date. The piece was written in 1966-7 and is in the manner of an English Bartók - full of rhythmic élan. This is marvellous music, vividly realised on this superbly engineered CD from Dutton." "It is an additional pleasure to welcome without reservation a CD of orchestral music by John McCabe, the more so as the composer - an excellent and selfless pianist - is the soloist in his own First Piano Concerto ... The Piano Concerto ... frequently did not do what I half-expected it to do. I had to go back to it quite a few times, on each occasion finding more within the score, until I now know it to be an outstanding composition, very finely performed on this disc. The work which immediately caught my imagination is Pilgrim ... which struck me forcibly as a work of high quality indeed. 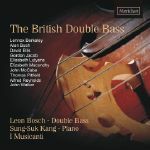 As Calum MacDonald rightly says in his admirable booklet notes, this work can stand alongside the Tallis Fantasia and Tippett's Concerto for Double String Orchestra as another supreme example of English string writing. The conductor Christopher Austin secures a noble performance and the strings of the BBC Scottish Symphony excel themselves ... the relatively recent ballet scores of McCabe have shown what can be achieved by a gifted and imaginative composer in this field. I have not seen Arthur Pendragon, but on the basis of the concert suite on this disc I should very much like to. There are four movements,which receive here vital performances in vivid dramatic style, very well recorded." "I remember poring over this piano concerto in Manchester's Henry Watson Music Library in my teens, eager to see how 'modern music' was written, but not until now have I heard the piece. Its opening at once brought back the notation - piano trills stretching over pages. The soloist's entry, remarkably, is a minute-long trill, recalled in the third movement. The overall four-part structure is complex and dramatic, the idiom lean and laconic, and, in this account, the work has an often explosive energy. Austin contrives a splendid climax in the string-orchestral Pilgrim, and gives a fiercely committed reading of music from the David Bintley ballet Arthur Pendragon." "The largest item is a suite from his recent ballet diptych, Arthur (1998-2001) ... The vigour and drive of 'Uther and the Tribes' and 'The Tourney' (in which Arthur draws Excalibur from the Stone) contrasts with the poignant beauty of 'Igraine and Uther'. The finale, 'The Lovers', is a complex conflation of two pas de deux for Lancelot and Guinevere and the ballet's climax, Arthur's vain and misguided massacre of the innocents (attempting to destroy the infant Mordred). Powerful stuff, the BBC Scottish SO's performance under Christopher Austin is inspired. With excellent sound, this issue is very strongly recommended." "As the title suggests, the works here share a double theme. All eight evoke landscapes of varying types, from the wide-open, multicoloured desert of the south-western USA (McCabe) to ancient vistas derived from Japan (Jackson Hill) and Finnish literature (Sibelius), from folklore (Kreek and Kodály) to Walter Raleigh's cell as he awaits execution (Chilcott). 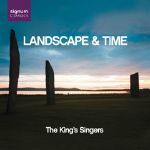 "Five of the works are commissions by the King's Singers, so unsurprisingly they prove well suited to their impeccably manicured vocal blend, enchanting the ear from first note to last. The McCabe and Maxwell Davies are the oldest, both from 1986. Although the innocent ear might be hard-pressed to identify the composers, they are both typical products of their creators' expressive missions, satisfying to hear and challenging to sing, especially McCabe's, with its kaleidoscopic range of tonal colours. "... Signum's sound is warm and close but the acoustic of St Andrew's, Toddington, gives the music room to breathe." "McCabe's Pueblo for solo instrument is a major piece written for Bosch. It vividly portrays the desert; not in baking sunshine but icy cold. You must not look for conventional brilliance here except in the sense that the composer adroitly captures a sullen and even ruthless mood. McCabe makes tangy use of the instrument's thrummingly deep bass and also its ethereal counter-tenor." "The three piano sonatas, however, are in different league. No.1, from 1957, is attractively virtuosic, albeit weakened by occasional lapses into keyboard posturing and predictable working-through of material. But it's a work John McCabe knows well and he plays it with considerable elan, as he does the richly textured and (in my view) more interesting Second Sonata. "Completing the collection is McCabe's terrific reading of the most recent Sonata No.3, premiered just last year at Weymouth ... These two discs should do much to bring Joubert's music to a wider audience." 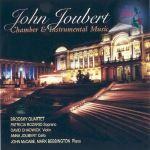 "John McCabe is a superb advocate of the three piano sonatas that span Joubert's career from 1957 to today." 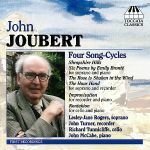 "Joubert's fellow composer John McCabe performs the three piano sonatas with such incisive flair that they alone make this set, with its warm, quite reverberant acoustic, well worth having." "... typically undemonstrative but perceptive readings of the piano sonatas." "Fifteen years separate the first two piano sonatas ... John McCabe recorded them both for Pearl some three decades ago and remains a consummate champion. He also performs the substantial Third Sonata (2006) ... with thrilling discernment and belief." "... John McCabe, who has long championed Joubert's work, in fine form at the keyboard." "... this lovely work is brought to life by John McCabe, with [Nicholas] Braithwaite conducting." "... John McCabe's limpid pianism in the often breathtakingly beautiful Third Rhapsody."